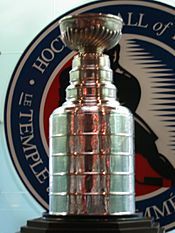 The 1983–84 NHL season was the 67th season of the National Hockey League. Twenty-one teams each played 80 games. The Edmonton Oilers beat the four-time defending Stanley Cup champion New York Islanders four games to one in the Cup finals. 1983–84 NHL season Facts for Kids. Kiddle Encyclopedia.